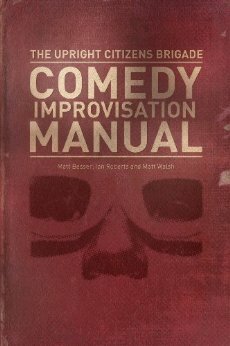 My copy of the Upright Citizens Brigade Comedy Improvisation Manual arrived on Friday and I have been reading through it over the last few days. Although I have not finished it, it’s obvious that this book is now essential reading for improv students everywhere. I think it’s going to have a big affect on how people learn, teach and perform improv. It’s also going to have a big affect on how we talk about it. Many of the terms in the book have appeared elsewhere and are probably familiar to most improvisors. For instance, many people have their own personal take on what game of the scene means. Often these explanations seek to simplify the definition in an attempt to demystify the term. This book elaborates on the term, defining game in a quite specific way and then laying out a detailed plan on how to get there. Some terms are new to me though, for instance, the term framing. For many years, if someone in a scene does or says something unusual for the circumstances, I’ve encouraged their scene partner to pick at that, to question it, to treat it as strange, to be skeptical of it. I didn’t have a single term for this and now I do. In this book, the UCB uses the term framing to describe this. Framing means letting your scene partner know that you feel that they have said or done something unusual within the context of the base reality. When you frame, you highlight or underline the unusual so that it stands out to your scene partner. New improvisers often fail to listen because they are searching so desperately for the Game of the scene in their own head. You shouldn’t have to search hard for the Game because it lies in your scene partner. Either your scene partner will provide the unusual thing or frame what you have said, thereby identifying it as unusual. I’m sure going forward, not only will I use the term ‘framing’ to describe this, I will likely be able to explain it more clearly and succinctly because of the book. It will also be wonderful to simply refer students to chapter 4 if they have more questions.